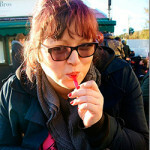 Our 29th “Follow them Friday” features Michelle of Very Hungry Explorer blogging in English. I wrote my first post back in 2009, but my blog was VERY different back then! I don’t have that post published anymore. Since I went veggie last year, I have to say I prefer eating in now. I’ve been finding it quite hard to find ‘normal’ restaurants (so that my hubby and friends can still enjoy meat) that have good vegetarian options in Brussels. This is a straight up tie between macaroni cheese and cheesy chips with gravy and chocolate. Eggs are my absolute favourite breakfast food, so I’m pretty happy no matter how they arrive, but boiled eggs with buttered soldiers is the winner. My Mum made a HUGE castle cake for my birthday when I was 6 or 7 – I can still picture it now – four huge turrets and blue jelly for the moat – brilliant. I’ve just qualified as an English teacher, so I think that is going to keep me rather busy, other than that; cooking, reading, photography and of course Brussels Food Friends.